I know it seems like not much is happening here but there are great things going on back in California where my mom lives. She has been receiving more packages AND as a result of all this...pregnant moms are coming in and asking for the meetings where they receive the knitted items!! That was the whole purpose of this blog, was to find a way to inspire these ladies to come into the clinic and start up with prenatal care...and its working! She has also received 2 more packages from you knitters out there. This is one that was sent by another friend of mine who lives up in Vermont, I LOVE that she sent in 2 Entrelac hats! I have yet to even think about trying to knit Entrelac. This is the second package she received, they are from another knitter who lives in New Castle, CA. Look at all the great items she included! The crayons, the toys, the clothes and blanket…just love it! “I just wanted you to know how much we appreciate what is turning up on our doorstep. I have sent some pictures. But there is more. We are able to give the gift bags to our NaAs patients. (I enclosed photos of them) And they are such a hit, that for the first time, we have Moms to be, actually asking for the interview. Then there are the wonderful things that cannot fit in the Moms bags. Along with the newborns, come siblings, and even Moms who could use unexpected gifts. I have always thought that we love the newborns, but those sisters and brothers need fussing over too, so we can do that. Even the Moms can be fussed over. And the clothes, I keep them for the ones that just have nothing. Or just need something. So, as you all can see, the items that you send in, whether they be handknit, machine knit or something other than a knit item, they are having the exact effect we were going for. The moms to be are asking for the NaAs meetings! That gets them in the door for prenatal care, and that gives those babies a much better chance of being born healthy! She has been receiving items from all over the place, there is a box on its way from Hawaii right now. From Hawaii! Not to mention the beautiful scarf from Scotland! When I stop and think about all these strangers are helping out the Yurok Tribe, well it just makes me tear up some…thank you all so much!! My plan is to have the first contest run Jan/Feb with the prize going out in March. If anyone has any thoughts on what to focus on for those months feel free to share. And I will post what the prize will be since I'm in charge of first contest once I figure that out myself since I'm still in brainstorm mode ;) If anyone has any thoughts/suggestions on this post feel free to share. 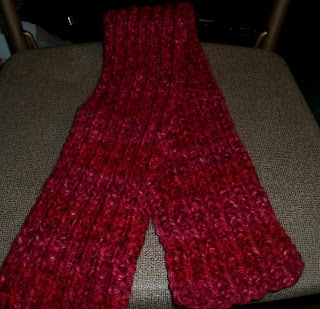 These are the 2 scarves I have made so far the pattern is called Scrunchable Scarf. 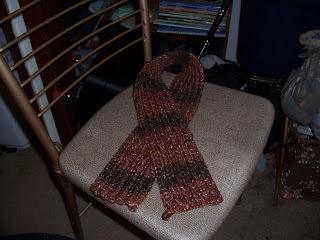 I made these on size 10 needles with Premier Yarns(Deborah Norville) in Chunky Weight Yarn. The brown color is Chocolate & the red is Berry Burst.